Next week emerging talent from the Roundhouse will be taking over your TV screens each morning on Sky News. Tune in for a week of topical debate and interviews as part of a project with Stand Up Be Counted (SUBC). 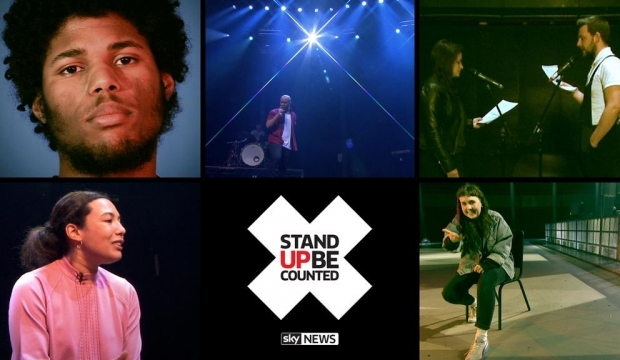 Sky News launched Stand Up Be Counted to help give young people a voice. It’s already becoming a showcase for creative and absorbing debate from 16 to 25-year-olds in their bedroom, back garden or high street, talking about the things that matter to them. So we asked five young artists from the Roundhouse to step up to the mic to voice their views about something that matters to them. The project, with SUBC, gave them the opportunity to talk about everything from poverty to healthcare and immigration to education through a performance piece. The performers involved include spoken word artists Kyronne and Deanna Rodger, theatre performer Izzy Tennyson, Queerhouse Radio producers Josh and Gemma and band Pocketclub who were all filmed in the main space at the Roundhouse ahead of next week’s activity. They’ll be joining Sky News Sunrise presenter Isabel Webster to talk about why this issue is important and why it’s time for politicians to listen to young people. We’ll bring you more next week about their performances but tune into Sky News Sunrise every morning next week (from about 8.30am) to see the brilliant acts in action!